A cookbook by Michael Rantissi & Kristy Frawley. Recipes from our restaurant Kepos & Co located at Shop 5, Casba, 18 Danks St. Waterloo, NSW 2017 Australia. 6 RECIPES FROM HUMMUS & CO. Put the peas in a bowl and crush them. Stir in the lemon zest, lemon juice and zest and 3 tablespoons of olive oil. Season with salt and pepper and set aside. Put the pastry on a prepared tray and bake for about 20 minutes or until golden brown, puffed up and very firm. Remove from the oven and set aside to cool to room temperature. Heat a chargrill pan or a barbecue grill plate to high. Drizzle the asparagus with 1 tablespoon of the olive oil and sprinkle with salt and pepper. Cook for 1 to 2 minutes, until grill marks appear. To assemble the tart, put the pastry on a serving or chopping board (as this will be easier to cut the tart) and top with the crushed pea mixture. Crumble the feta evenly over the tart. 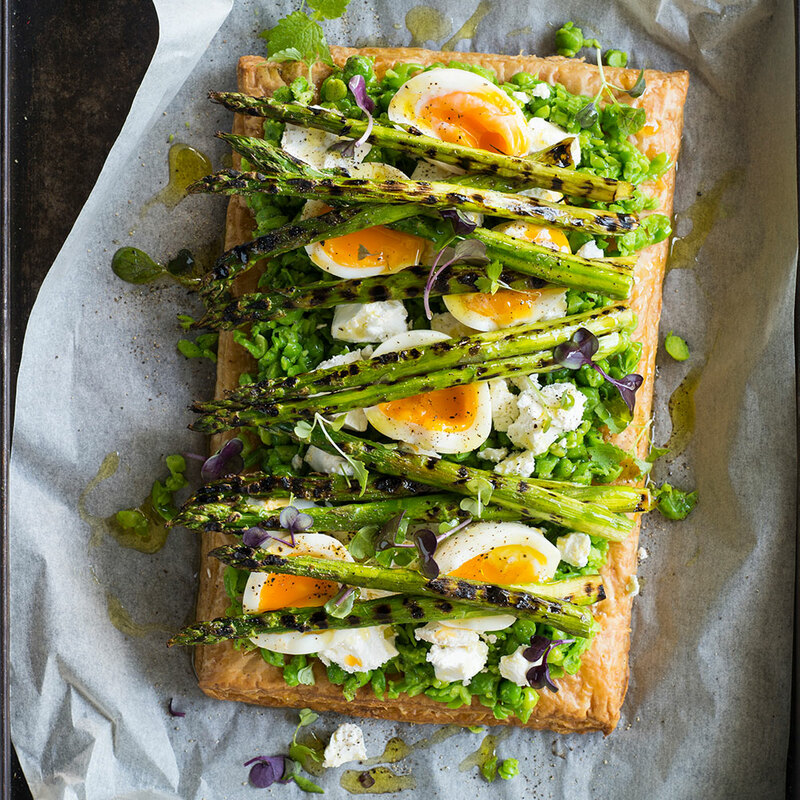 Tear the eggs into half and arrange them on the tart. Top with the grilled asparagus, sprinkle with sea salt and cracked black pepper. Drizzle additional olive oil and micro herbs if using. Put the rainbow trout on the tray. Drizzle with the oil and season with salat and pepper. Bake for 15 to 20 minutes or until done to your liking. Put the tahini in a bowl with the garlic and 250 ml water. Season with salt and whisk until smooth. Pour this mixture over the cooked fish and bake for 1 minute, just until the tahini is lukewarm (overheating the tahini will cause it to curdle). Serve the fish garnished with the pine nuts, parsley and chilli. Preheat the oven to 180°C. Line a flat baking tray with baking paper. Toss the pumpkin with the olive oil, salt and garlic cloves and put on the baking tray. Bake in the preheated oven until the pumpkin is soft, approximately 20 minutes. If the pumpkin is colouring too quickly reduce the temperature. Whilst the pumpkin is cooking put the burghul in a large bowl and top with boiling water. Let the burghul sit for about 6 minutes. During this time the burghul will soak up a lot of the water. Drain and once cool enough to handle squeeze out any excess water. Mash the pumpkin with either a potato masher or a fork then mix in with the burghul. Add the cinnamon and cumin then season with the salt and pepper. Mix to combine. Use a long rectangular baking or roasting dish that you will also use as the serving dish. Spray with non-stick oil then line the dish with baking paper, so it covers the base of the dish but does not overhang. Spread half the pumpkin mixture over the base of the dish. Add the grated mozzarella cheese then top with the remaining pumpkin. Smooth out the mixture so the top is even. Using a sharp knife score diamonds into the mixture. Set aside until ready to cook. Cook in the preheated oven for 25 minutes. You can cook it longer if you prefer a very crisp topping. Put the bread cubes on a baking tray and then drizzle over the olive oil and mix to combine. Bake for 7 to 8 minutes until the bread is toasted and golden in colour. Set aside to cool. To make the dressing, mix all the ingredients together and season with salt and pepper. In a large mixing bowl, add the bread, cucumber, tomatoes, onions, herbs and pomegranate seed and mix to combine. Pour over the dressing and toss lightly using your hands. Drizzle over the pomegranate molasses. Heat a 24c ovenproof frying pan over medium to low heat. Add the sugar and 50 ml water and cook, swirling the pan without stirring, for 7 to 8 minutes, until the caramel turns a nut brown colour. Add the butter and stir to combine. Remove the pan from the heat and set aside. Put the kataifi pastry in a large bowl and gently separate it with your hands. Pour in the melted butter and gently mix through. Carefully arrange the banana pieces in the pan with the caramel. 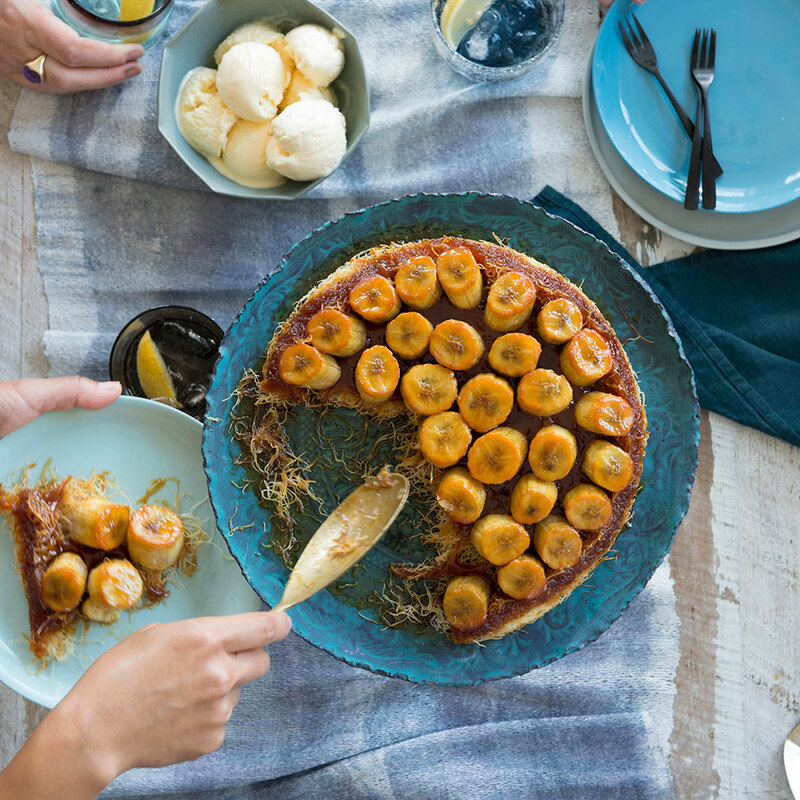 Spread the kataifi pastry over the top of the banana in an even layer. Press down and flatten to give an even colour. Bake in the preheated oven for 20 to 25 minutes or until golden brown. To serve carefully turn the tarte tatin onto a large plate. Preheat the oven to 160°C. Spray a 20cm x 30cm rectangular baking dish with non-stick oil and line with baking paper. Using an electric mixer fitted with the whisk attachment, whisk the egg whites for 2 to 3 minutes until soft peaks form. With the machine running, slowly add the caster sugar and then whisk for a further 8 to 10 minutes, until glossy and firm. Use a metal spoon to fold in the vinegar and rosewater. Spoon the mixture into your prepared tin and make the top smooth. Bake for exactly 20 minutes, then remove from the oven and set aside to cool completely. Don’t worry if the meringue looks a bit rustic when you take it out of the oven. Put the mascarpone, cream and icing sugar in a large bowl and whisk until soft peaks form. To assemble, cut the meringue in half so there are two 20 x 15 cm pieces. Put one piece on a serving plate and top with half the mascarpone mixture, half the grapefruit segments and half the Turkish delight. Top with the remaining meringue, then the remaining mascarpone mixture, grapefruit and Turkish delight. Scatter over the pistachios and rose petals. 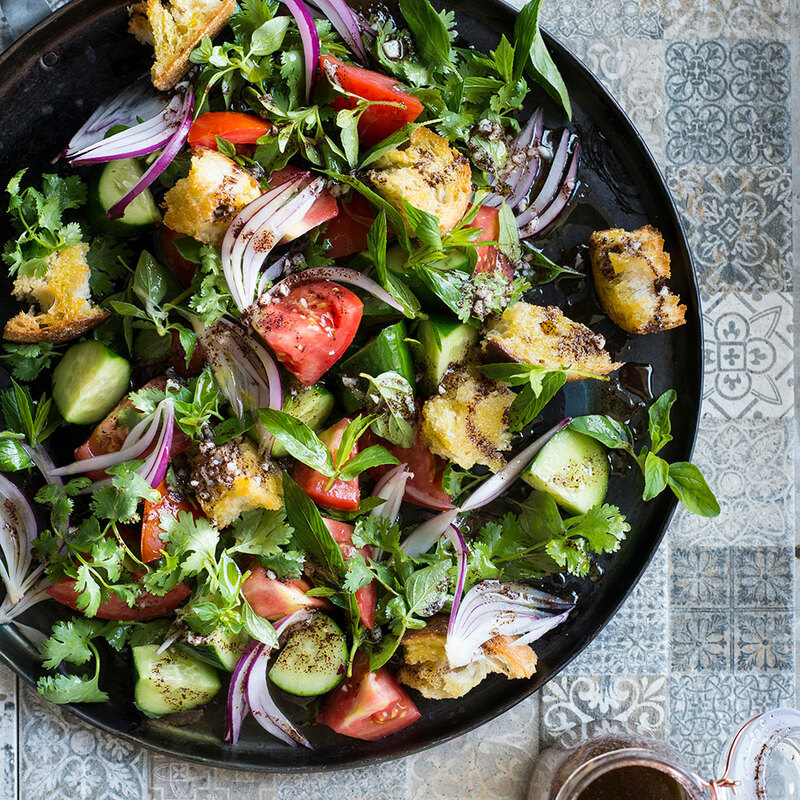 Israeli-born chef Michael Rantissi and his partner and ‘balaboosta’ Aussie girl Kristy Frawley drill down to what we all love about the ingredients and flavours of the Middle East – grains and greens, generosity, pungency, sweetness, sharing. This is food that brings everyone to the table, and won’t let them leave. 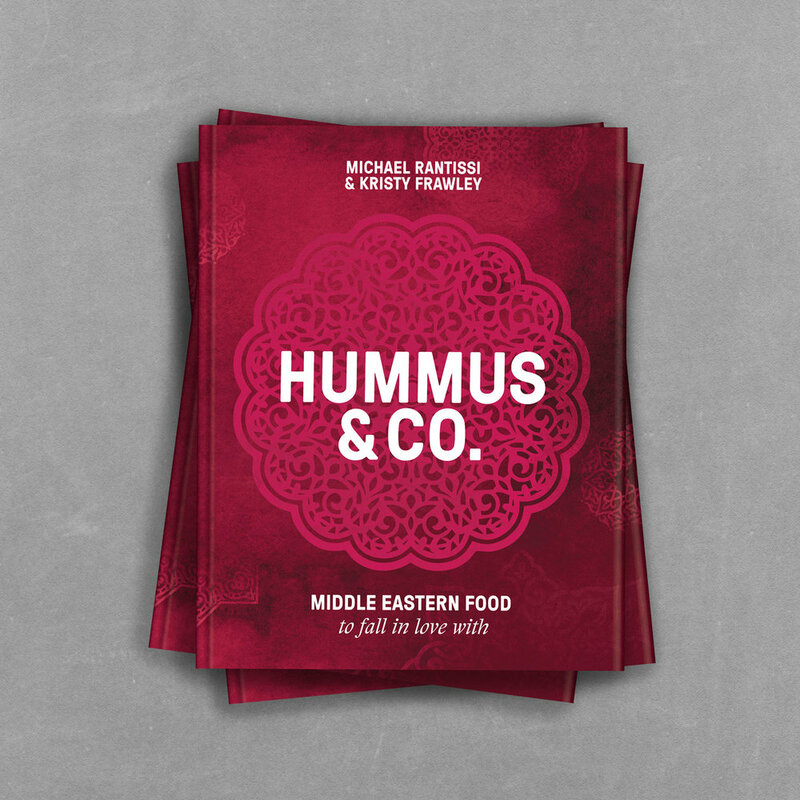 Michael puts ingredients first and foremost, opening the door to our greater understanding and appreciation of the Middle East’s hidden treasures — tahini, baharat, halva, chickpeas, labneh, eggplant, honey, pomegranate, dates, broad beans, pistachios, wild greens, ancient grains. The recipes go from basics like hummus, aioli and falafel, to Persian eggplant risotto, Cauliflower, cranberry and pearl barley salad; and Harissa-braised lamb with okra. To finish are the pastries, breads and syrup-laden cakes that turn a meal into a feast – Chocolate and pistachio baklava, Date and dukkah brownies, Persian pavlova. Living in multicultural Sydney, he says, has helped him lighten and brighten traditional recipes, without ever losing sight of their origins and traditions. ‘If my mother knew I was serving falafel for breakfast – and people were loving it – she would be amazed’. A much-lauded home cook, Kristy adds those all-important pastries, breads and syrup-laden cakes that turn a meal into a feast, any time of the day or night.